Don’t know about you, but I’m not taking my money out of Tabung Haji. LEMBAGA Tabung Haji does not seem to have had much luck in investing in the oil and gas sector. The pilgrim fund is probably among the biggest victims of the beleaguered O&G outfit Perisai Petroleum Teknologi Bhd. Bluntly put, Perisai is just one of Tabung Haji’s many failed investments in the sector, which is experiencing a severe downturn. On Oct 4, Tabung Haji sold 1.75 million Perisai shares, trimming its equity interest to 76.43 million shares or 6.06%. That day, Perisai’s share price traded between 8.5 sen and 10 sen, which means at the higher end, the pilgrim fund would have got a mere RM175,000 from the share sale. Ironically, prior to the sale of the 1.75 million shares, Tabung Haji’s last transaction in Perisai shares was almost exactly a year ago — on Oct 7, 2015 — when it sold 600,000 shares. The pilgrim fund’s investment loss would not have been as bad if it had sold more shares then. To recap, Tabung Haji surfaced as a substantial shareholder in Perisai on Dec 23, 2014, after it bought 1.2 million shares, bumping up its holding to 79.88 million shares or 6.7%. Malaysian lenders are bracing for a hit to profits this year as they bump up provisions for sour loans to the local oil and gas services sector that has been battered by the slump in energy prices and cutbacks in projects. The problem mirrors pain playing out in neighbouring Singapore, where the collapse of oilfield services firm Swiber Holdings Ltd has stoked concerns about the size of the city state’s biggest lender DBS Group Holdings’ exposure to the industry. Last month, Malaysia’s Perisai Petroleum Teknologi , an offshore oil and gas services provider, said it was aiming to renegotiate terms with bondholders on a S$125 million bond. Hess, do you know about this? Isn’t Ezra the same group as Perisai? EMAS Offshore Limited (“EMAS”) (OSE:EMAS) has entered into a letter of undertaking with Ezra Holdings Limited (“Ezra” or the “Buyer”) on 15 December 2015 (the “Undertaking”). Pursuant to the Undertaking, Ezra undertakes to buy from EMAS its entire 12.13 % stake in Perisai Petroleum Teknologi Bhd (“Perisai“). Perisai is a Malaysian-based upstream oil & gas provider and is listed on the Main Market of the Bursa Malaysia Securities Berhad. EMAS acquired the 12.13% stake in Perisai on 21 August 2013 as part of the consideration when EMAS sold its 51% stake in EMAS Victoria (L) Bhd to Perisai. 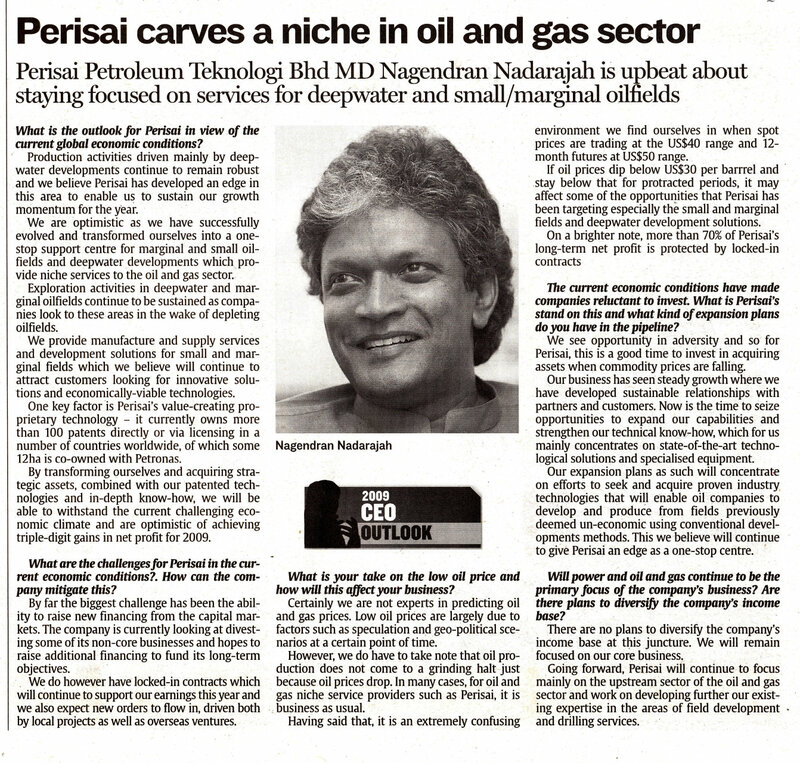 KUALA LUMPUR: Perisai Petroleum Teknologi Bhd hopes to either build or acquire more strategic marine assets to assist in the offshore installation of small fields and deepwater developments, says managing director Nagendran Nadarajah. He said the company planned to co-own the assets via partnerships and joint ventures, as financing was somewhat limited in the current economic slowdown. “Now is the time to build more strategic assets in preparation for the next rebound in oil price. Another opportunity for you wheeler dealers out there. You can subscribe to an online version of the paper at the Bluehyppo site, follow links to e-browse. Those of you who complain that it’s difficult to get jobs in the oil & gas industry, you should go talk to Perisai Petroleum. Perisai Petroleum Teknologi Bhd MD Nagendran Nadarajah is upbeat about staying focused on services for deepwater and small/marginal oilfields.